Quick and easy, and perfect for a midweek meal, I really love this recipe. I think it would work perfectly with any Lamb or Beef sausage. 1. Preheat oven to 180°C. Meanwhile, combine the chickpeas, half of the olive oil, cumin, paprika, half of the garlic, and a pinch of salt and pepper. Toss well, and then throw onto a baking sheet. Spread out in a single layer, and then nestle the sausages amongst the chickpeas. 2. Place the baking sheet in the oven and cook for about 30 minutes, tossing halfway through. 3. While the chickpeas and sausages are baking, chop up the Swiss chard leaves. Pour the remaining olive oil into a large pan set over high heat. Add the rest of the garlic, and let it cook for a few seconds, stirring often so it doesn’t burn. Then add the chard. Season with salt and pepper, and stir often. After a minute or so, add half the vinegar. When tender, about 5 minutes or so, taste the chard to see if it needs more vinegar. 4. Combine the chard with the roasted chickpeas in a large bowl. Toss. 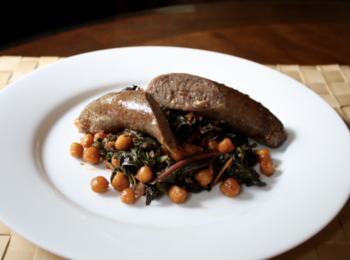 Serve the the sausage over the chickpeas and chard mixture.